Before going into this Star Trek Panic review, I should point out that only a few of the people in our group are huge Star Trek fans. However, we all enjoy playing Castle Panic, so we couldn’t wait to play this new version. What is Star Trek Panic? 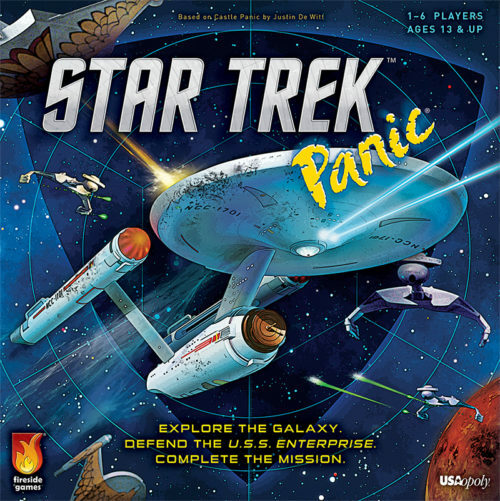 Star Trek Panic is a cooperative strategy game designed by Justin De Witt in which players are attempting to protect the U.S.S. Enterprise. You will take on the role of one of the popular Star Trek characters and fly the ship, go on missions, and fight off enemies. After picking one of the seven characters and drawing cards, your team is ready to begin the game. Throughout Star Trek Panic, you will be using your cards to complete mission objectives and take down incoming enemy ships. Your goal is to complete five missions, each of which comes with different objectives. Every mission has its own timer, so the team has to work together to both hold off the enemies and fulfill those mission requirements. After you have taken your turn and have checked the mission status, the enemies will have their turn. First they will move one sector closer to the Enterprise, then they will fire if they are within range. They will first be aiming at any shields in front of them, then they will be able to hit the Enterprise’s hull. Each part of the ship can take two damage before it is destroyed. If you are unable to complete five missions and keep the enemies from destroying six hull sections, then the whole team loses. If you want to see a more complete overview of the rules, be sure to check out the official Star Trek Panic rulebook (PDF). Check out Star Trek Panic at Amazon! Easily the best thing about Star Trek Panic for us is the fact that it requires a ton of teamwork. You have to look ahead together to figure out the best way to complete the missions and take down enemy ships. You’ll be talking about which cards to trade and which ones to save for any mission objectives. It’s a true cooperative board game. Believe it or not, the designers of this little Panic game have done a great job of bringing the Star Trek theme to life. The missions are based on actual episodes from the show, and even the characters’ special abilities fit thematically. We haven’t played all of the Star Trek games yet, but this one is definitely our go-to for now. We don’t usually mention game inserts on this site, but we have to point out that the Star Trek Panic insert is one of the best we’ve seen. It was designed to fit everything in the box perfectly, including the constructed ship. A minor issue that we’ve had with the game is the lack of creativity with the missions. There are 18 mission cards, which is great, but a lot of them are very similar. Many of them simply have you move in a certain direction and use a couple of cards to complete them. We do like the fact that they added missions for this game, but it would be great if they came out with some cooler ones. The game runs a bit longer than the other Panic games out there, which could keep some gamers from buying this one. 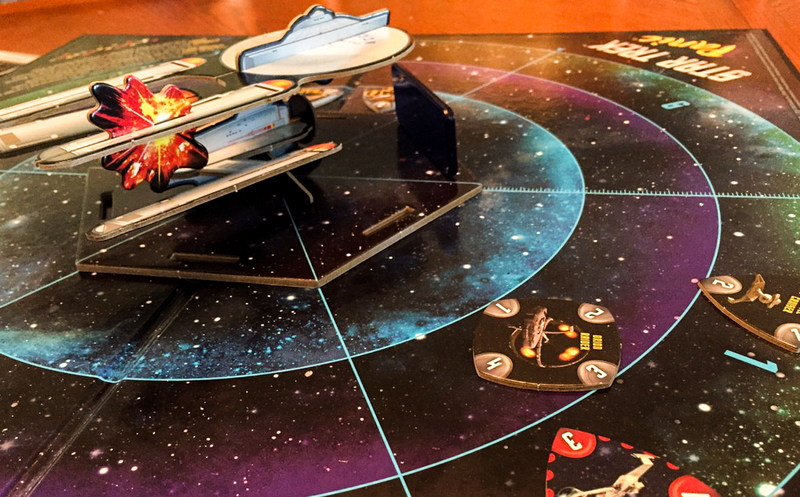 If you like cooperative games and happen to be a Star Trek fan, then you simply have to get Star Trek Panic. If you like the Castle Panic system and want a slightly more challenging game with more mechanics, then chances are you’ll like this one as much as we have. We’re going to keep Castle Panic on our top family board games list over this one since it is easier to teach, but this is our favorite (base) game in the series right now. Thanks for taking the time to read our Star Trek Panic review!